The purpose of thimbles are to underline and support the eyes made by looping the exteriors of wire ropes together. As alternatives to wire clips and swage sleeves thimbles create a durable wear surface & aid in supporting the wire rope eye by preventing pinching and fraying of the wire rope. Thimbles can be used with swage sleeves or wire rope clips. 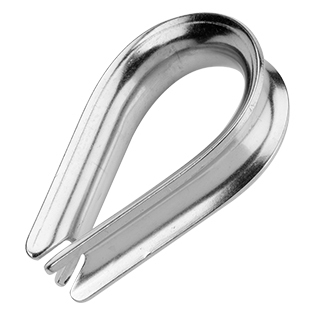 Available in standard duty, heavy duty, zinc plated, galvanized, stainless steel material. US Rigging offers a wide variety of metals and sizes to best suit your needs, Including AN100 type and Federal Spec FF-T-276 B type. gusseted. tube and nylon thimbles.